Rubio opposes requiring employers in general to certify that no qualified Americans are available for the jobs they wish to fill with H-1Bs. Rubio believes that the main abuse of the H-1B program comes from the IT services firms, “rent-a-programmer” companies such as Infosys. Presumably Rubio is not claiming that the I-Squared bill, of which he is a cosponsor, addresses the abuse. On the contrary, it is the most flagrantly pro-employer bill I’ve ever seen, vastly expanding the overall H-1B cap, setting an infinite cap on one important aspect of the program, and greatly liberalizing the employer-sponsored green card program. It contains no protections for U.S. workers whatsoever, not even the pretense of protection as some bills include. I must say, though, that it’s hard to blame Rubio for the his views in the two bulleted items above. As I’ve often pointed out, even many H-1B critics agree with the second item (albeit quite mistakenly), and the second item essentially implies the first. Even the other statement by Rubio’s spokesperson, “The program is designed to protect, not displace, American workers,” is consistent with the second bulleted item,” as the law places special restrictions on the IT services firms, a provision whose enactment was motivated by a perception that they are the main abusers of the visa. As my reader pointed out to me, none of the politicians calling for expanding H-1B are addressing the fact that expansion is unwarranted, as there is no labor shortage, either in STEM in general or in IT. Wages have been flat, as even the pro-H-1B researchers concede. It will be interesting to see what the politicians will propose to counter actions like those of Disney, SCE and so on. Disney, for example, is closely tied to the major industry lobbying group FWD.us, and as the firm has a major presence in Florida, Rubio might be reluctant to do much to clip their wings. Sen. Hatch, the primary I-Squared sponsor, has proposed raising the wage floor for the IT services firms from the current $60,000 to $95,000. That is not in his bill, and I don’t believe for a minute he was sincere in that idea. And even if he were, the IT services firms would rightly howl, asking why it’s OK for the other firms to pay their H-1Bs less than $95,000. Another reader, a Silicon Valley engineer, suggested recently to me that the tech industry is on the verge of another 2000-like implosion, and that the industry is currently scurrying to get an H-1B expansion bill passed before that occurs. He points to the fact that many of the startups are burning through funding right now with little or no positive results. This is indeed what happened in 2000, a year that culminated in both mass layoffs and legislation that increased the H-1B cap from the then-limit of 115,000 to 195,000. In discussions of H-1B politics, this is seldom noted — a major H-1B expansion enacted just weeks before a surge of tech layoffs. The few responsible dwellers of Capitol Hill ought to keep this in mind. As I’ve noted before, all of this is at least making for good theater. One of the common types of such pieces is to present the current, “greatly oversubscribed” 65,000+20,000 yearly cap on new visas as causing the U.S.to lose many superstars who could make extraordinary contributions to the American economy if they were only allowed to stay here. The typical article will profile a few supposedly brilliant foreign students, and say that we are losing (or have already lost) them. Today’s Fortune article, “Foreign B-School Grads Left Out in the Cold in U.S. Job Market,” is a case in point. Yet, by Vivek’s own account, Nijsure is the epitome of my characterization of most H-1Bs as “ordinary people, doing ordinary work”: Degree from University of North Texas, working in Quality Assurance, i.e. software testing. This is a case of special interest to me, as a reporter who had written about Awasthi back in 2008 called me a couple of months ago. The reporter, Mark Roth…told me that he had written about such “loss” [of talented foreign students] in 2008, using Awasthi as an example of a foreign student graduating from a U.S. school but who had been forced to return to his home country because of a shortage of work visas. After the call, I looked up Awasthi, and found his LinkedIn entry. Turns out that he had not been forced to return to India after all! He landed a job with a U.S. firm in the financial field, which had been his goal. How do these seemingly “gone” people turn out to be working in the U.S. after all? First, it is important to note that, contrary to the rhetoric used by the lobbyists and the politicians (the former teaching the latter what to say), we do NOT “send the foreign students home after they graduate.” Due to the OPT part of the F-1 visa, foreign students in STEM can work for 29 months after graduation (which the Obama people want to change to 36). During this time, they have full work rights, and the employer can use this as a holding pattern until the worker gets an H-1B visa. Another major route to take is the L-1 visa, for intracompany transfers. The employer sends the foreign student to work for a foreign branch of the firm, and then brings him/her back to the U.S. under L-1, which by the way has no cap. The Fortune article mentions this. L-1 used to be used mainly by the IT services firms, but recently the mainstream tech firms have found it to be a gold mine. Finally, have you been so foolish (I was, actually) to believe those numbers concerning how many more H-1B visa applications there are compared to the 65K+20K cap? As reported by the Wall Street Journal, in many cases multiple applications are being submitted, by different employers, for the same worker. The lucky worker, having received several job offers, waits until it is known which of those employers have gotten a visa for him/her, and then simply accepts one of those offers. Classical political ruse, double counting. Now, what about those foreign students profiled in the Fortune article — are they superstars? Since I generally take a dim view of MBAs, that will be a tough sell with me. The lead exhibit, Sudhanshu Shekhar, seems to be a very social type who is active in student organizations, but is that all Fortune can offer as evidence of potential stardom? He seems to have developed a clever marketing package for Best Buy, and he is an IIT grad, good, but really, he doesn’t seem that special. And again, the U.S. isn’t losing him anyway; according to the article, his employer will put him in Holland for a year and then bring him back to the U.S. as an L-1. By the way, the article contains a curious bit of cognitive dissonance. On the one hand, it says that “U.S. MBA programs have admitted larger and larger numbers of students from outside the U.S. to increase diversity and bring more of a global mindset into the classroom,” but on the other hand notes that “Many of the companies that refuse to consider foreign-born MBAs…[cite] cultural differences.” Maybe the globalist view being promoted by the schools don’t jibe with business goals? But now, Shekhar, who graduated from Kellogg with an MBA last year, is about to leave the U.S. in frustration, the victim of a controversial, lottery-based work-visa program that puts international MBAs in the same category as foreign mid-level IT workers accused of taking jobs from Americans. In following up to my last posting, I just went to LinkedIn and plugged in “HP software engineer graduate” and found a number of ads for new and recent graduates. Most of them also have that same “proficiency in English and the local language” requirement, in spite of all being in U.S. locations (Roseville CA, Fremont CA, Houston, Montgomery AL, Vancouver WA). One of them is again for a position with that same bizarre title, Associate Software Engineer. PhD in Computer Science or related technical discipline. Large scale systems design experience with knowledge of Unix/Linux. Programming experience in one or more of the following: C/C++, Java, Python. Even the list of Preferred Qualifications is very generic, except for research experience, and even the latter is not specific either — you have your choice of 10 different areas, including the catchall Systems. Based on my experience, I’d say the odds are high that the employer, YouTube/Google, has a specific foreign student they want to hire, and this ad is just for the purposes of fulfilling green card requirements. The generic nature of these job requirements puts the lie to the industry’s favorite line that it hires only young people because only new grads know the latest technologies. Well, there is nothing avant garde about any of the technologies lists. A lot of jobs that came up in that search were for Google. One for Qualcomm was interesting for how NON-generic it was, with the hugest alphabet soup of acronyms for wireless protocols you’ve ever seen. There’s no way a new grad would know more than one or two of them, and even then no very well. Again, this sounds like a green-card camouflage ad to me, and of course Qualcomm has always been one of the most vociferous firms pushing Congress to expand the H-1B cap. Once again: If you think the main abusers of H-1B are the IT services firms, think again. One aspect of the H-1B work visa program that I frequently emphasize — yes, yes, that I harp on — is that a core issue of H-1B is age. Younger workers are cheaper, and the vast majority of H-1Bs are young. Concomitant with that is that the few Americans that U.S. employers do deign to hire as programmers tend to be new or recent grads. (Note: See Hal Salzman’s research for justification of my word few here.) Intel even has acronyms NCG (new college graduate) and RCG (recent CG), and earmarks jobs accordingly. This is common among the large employers, and I’ve pointed in the past to specific job ads like this for Intel, Facebook and so on.This discriminatory practice is of questionable legality, according to a prominent employment lawyer I asked a few years ago, but no one has ever challenged it. Yesterday an alert reader came across an HP job ad that is not only is explicitly excusionary toward older American workers, but is also apparently exclusionary toward Americans, period. The position is for an Associate Software Engineer (odd title, more on this below) in Roseville, CA, a major HP site, near Sacramento. Here’s what it says. Must be a recent graduate (2015) or graduating by January 2016. Of course, it’s clear what is likely happening here: HP has a foreign student that they want to hire, for a job requiring some foreign language, and they want to justify sponsoring the student for a green card, hence the language requirement. Some of you will say, “But this is a legitimate use of the H-1B/green card programs. They need to hire a foreign worker, because they need the foreign language.” Well, you’re wrong. There are many programmers, born abroad but now naturalized U.S. citizens who almost certainly could do that job. Their only problem is that they’re not cheap, which brings me to the issue of that job title. As I’ve often mentioned, the age issue could be easily fixed. Congress merely would replace the four-tiered system for determining prevailing wage, the legal wage floor for H-1B/green cards, by a single level, not broken down by age/experience. Once again, what is sadly overlooked in the recent cases in which H-1Bs were used to replace American workers at Disney and SCE is that the foreign workers were cheap due to their AGE, or more precisely speaking, their low level of experience, which qualified them for the lowest of the four wage tiers. The bills introduced in the past by Senators Grassley and Durbin would have changed the current four-level structure to a single level, in which prevailing wage would be defined as the 50th percentile salary for the given occupation and the given region — and NOT for a given experience level. DPE, and more recently EPI, have even suggested using the 75th percentile, on the grounds that the industry claims the H-1Bs are “the best and the brightest” or have rare skills, something employers would have to pay more for on the open market. In this light, I strongly recommend Daniel Costa’s recent op-ed (though I disagree with his focus on the IT services firms). A number of people have been writing to me about the New York Times’ recent coverage of the H-1B work visa. They ran a major piece on June 3 regarding Disney’s replacing American IT workers by H-1Bs (“immigrants,” in the reporter’s inaccurate terminology), and now have run an editorial expressing concern about the matter. 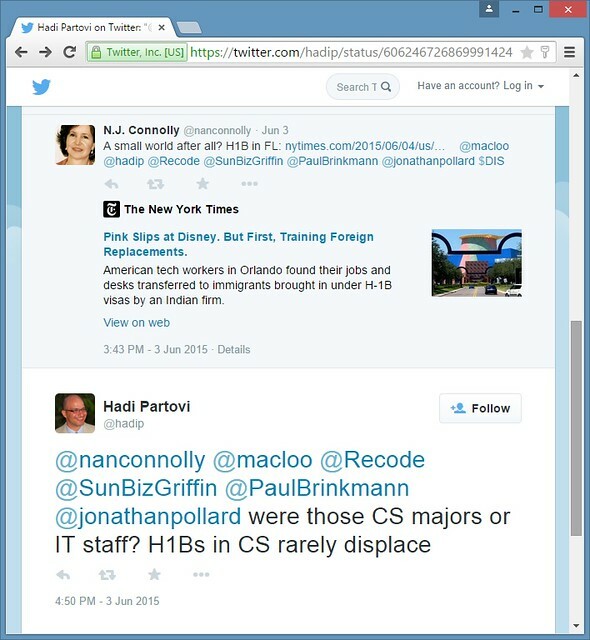 Those who have been contacting me regard this as a major turnaround of NYT on the H-1B issue, a shedding of bias. I’m not sure this is true. The paper ran some excellent articles on the visa in the late 1990s (after a very bad false start), but simply stopped covering it after 2000. I’m not sure why that is the case, but on the other hand, it’s not as if they’ve been running pro-H-1B articles. A mass influx of foreigners doing the jobs of the workers they displace is clearly not what the law intended. Congress surely did not want to give companies a more efficient means of slashing payroll costs while pushing more people to the curb. But despite common perceptions about the H-1B law, it does not require companies to recruit American workers before looking overseas. That simply isn’t true. From what I know of the history of H-1B, cutting labor costs was indeed the intent right from the beginning, though of course it was described to the public as a means of filling labor shortages. I confirmed this with John Miano, who knows the history in fine detail, and he replied that was preparing a blog post on the matter, which is now available; I urge you to read it. I should add, that there are some who claim that the authors of the statute did not anticipate the role of the “rent a programmer” firms, the IT services firms such as Infosys and TCS, in the H-1B picture, which is what happened in the Disney case. For reasons I won’t go into here, I find that claim credible. But it is irrelevant. It is very clear to me that the authors of the statute did intend for the visa to be used as a means for employers to hire cheaper foreign workers instead of Americans, which is just as bad as using H-1Bs to replace Americans. Unfortunately, this is something that many critics of the visa program simply don’t get, due to their unwarranted fixation on the IT services firms. The Times also erred big-time in stating that the Senate’s comprehensive immigration reform bill, rejected by the House, would have solved the problem by adding U.S. worker protections regarding H-1B. Definitely false, sad to say. Back in April, a bipartisan group of U.S. senators sent a letter to several government agencies, asking them to investigate apparent abuses of the H-1B work visa program, in which the giant utility Southern California Edison reportedly laid off American IT workers, replacing them by foreign workers, and forcing the Americans to train their foreign replacements. At the time, I expressed doubt that the letter would have any benefit, and in any event, the main agency involved, the Department of Labor, refused to investigate. But today Senators Durbin and Sessions announced that DOL has had a change of heart. Presumably this is because another case of much higher visibility than SCE has come to light: Disney. This development is sure to thrill many critics of H-1B. Well, even I like it, but just because it will make for good theater. 🙂 Little or no good will come out of it, and indeed, it will likely make things even worse. What will DOL say? They will find, correctly, that SCE and Disney, and their IT outsourcer labor suppliers, did nothing illegal. These firms were almost certainly acting entirely within the law (or the law as it has been interpreted over the years, a point I’ll come back to below). A reader asked me why I had not devoted a blog to the New York Times piece on the Disney case, linked to above. The reason is that article takes this same point of view that I complain about so much, the perception that the main abusers of H-1B are the IT outsourcing firms; the reporter repeated this in a radio discussion yesterday. Not the reporter’s fault, really, since this view has become Conventional Wisdom, and yes, I do harp on this issue. But as I’ve said, this perception is incorrect and will be used by Congress as reason to actually increase the H-1B cap (while making some mild restrictions on the IT oursourcing firms). The reader’s point was that at least the Times is now giving H-1B prominent coverage. Actually, they did so in the late 1990s (after one false start in a very one-sided article), but later somehow didn’t pay much attention to the issue. This may be a result of the massive PR campaign by the industry, claiming a STEM labor shortage and portraying the H-1Bs as engineering geniuses. The original letter from the Senate had requested DOL et al to suggest reforms in the law. It seems doubtful that such a response will be forthcoming from such an arriba immigracion administration (not that I don’t agree with that stance to some degree), but if there is one, it will be some mild proposal to tighten up on the IT outsourcing firms, letting the Intels and Googles go scot free, and indeed, giving Congress the green light to expand H-1B and even add new similar programs, such as for foreign students. For reasons I’ve never understood, none of the major players interested in tightening up on H-1B — activists, researchers, sympathetic people on the Hill — want to touch the age issue. Again: If they won’t touch it, why should DOL? It would be an easy fix, simply doing away with the experience-based wage levels, and would not have to explicitly cite the age issue. This simple change would go a long way toward reducing the abuse (again, including by the Intels and Googles). But sadly, no one wants to go that route. There is one wrinkle, though, that I’ve seen brought up a few times recently, which concerns the statutory stipulation that “employment of the H–1B worker will not adversely affect the wages and working conditions of similarly employed U.S. workers.” Years ago I said, half jokingly, to a reporter that losing one’s job to an H-1B would be “the ultimate in adverse impacts on working conditions.” 🙂 But that obviously is not how the law has been interpreted. On the contrary, by disallowing the replacement of Americans by H-1Bs in the specific case of the formally defined group of H-1B dependent employers, Congress has implicitly (and as I understand it, legally) given approval of such replacement in all other situations. I do admire those in the Senate for bringing up. As I said recently, so many of those in Congress who used to speak out against H-1B are now strangely silent (e.g. Stabenow, DeLauro, Pascrell). But my advice to those readers who strongly hope for proper reform of H-1B is, don’t pin your hopes on this investigation. 1. John Miano, founder of the Programmers Guild and tireless critic of H-1B, has an interesting new book out with prominent journalist Michelle Malkin. This combination — Miano “knows where the bodies are buried” and Malkin is famed for her outspokenness — should bring tons of attention to the H-1B fiasco. 2. DHS is proceeding apace with its plans to implement (I almost wrote “enact,” an ironic error in view of this blatant end-run around Congress) yet another extralegal expansion of Optional Practical Training. OPT gives foreign students 12 months (29 months for STEM) of work authorization after graduation from a U.S. university. Under the proposed rule (again, I almost wrote “legislation”), OPT would be good for as long as SIX YEARS, just like H-1B. In other words, it would be in effect another H-1B program, in addition to the one we have. John Miano has been leading a lawsuit against the previous expansion of OPT. Many have pointed out that employers of OPT students save money by virtue of not being subject to Social Security taxes. But that is small potatoes–the real issue, as usual, is that OPT expands the pool of YOUNG workers. As I’ve pointed out, for instance, this is the core of how SCE, Disney and so on can legally save lots of money by hiring foreign workers — the latter are younger, thus, much cheaper, than the Americans they replace. 3. (Thanks to Theo for pointing this out.) The Fwd.us “Major Contributor” Hadi Partovi, whose organization claims to be responsible for teaching the first president to ever have written a line of code, says “H-1Bs in CS rarely displace [American tech workers].” He was distinguishing between “IT” and “CS,” and his point was that the firms that really do computer science, e.g. the Intels and the Googles, don’t abuse the H-1B program. As many readers know, I strongly disagree with that claim, and would add that it’s even worse for those firms — instead of having foreign workers displace Americans, they simply hire the foreign workers instead of qualified Americans in the first place. (And again, it’s largely because of the age issue.) By the way, my guess is that the first president to write a line of code was Jimmy Carter, an engineer by training, rather than Obama as Code.org claims. 4. Lest you think that the household-name American tech companies are angelic and that only the Indian outsourcing firms are villains, we now have yet another age discrimination lawsuit by an American against a tech firm, in this case Cisco. Though I don’t have data, I’m told that Cisco is one of the worst offenders regarding H-1B, and some of you may recall it’s being exposed for engaging in a legal but sleazy tactic regarding foreign workers. In light of Item 2 above, I suspect that Ms. Stahl was replaced by a foreign worker.